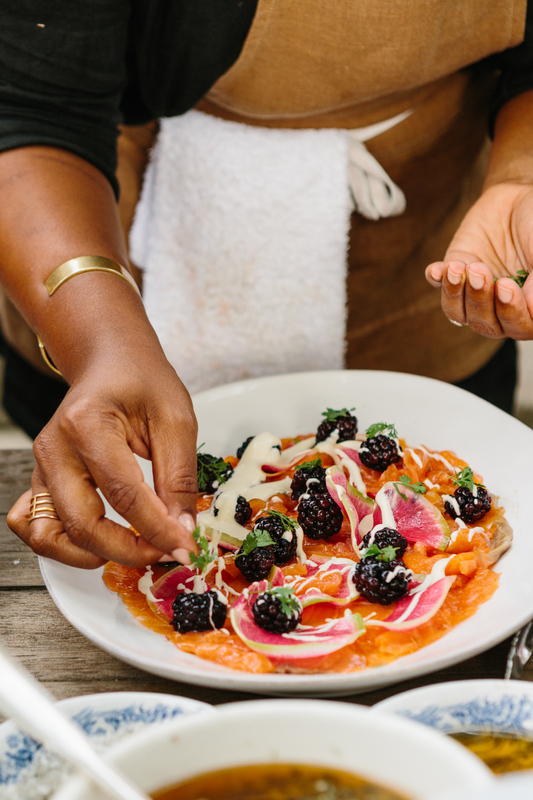 Olaiya wears many hats: she leads culinary tours through Portugal and Paris, has a background as a chef, runs the smart site about home cooking called Milly's Kitchen, hosts sumptuous dinner parties with her friend and collaborator, chef Kyle Wisner, and photographs all of it. She has a keen eye for details, and all of the sensory delights of a beautiful meal. Coming together around food activates some of what is most essential for a community to thrive. This night feels like a little snapshot from summer, and of all that's good in the world: a celebration of food, friends, and community. I'm a chef and photographer. I teach cooking classes, host a series of pop-up dinners and lead food and photography retreats designed to help people bring more creativity and inspiration into their lives. Oh boy. Circuitously! :) I studied French and art history as an undergrad. As part of my major, I spent a year living in Paris which sparked a lifelong love of both food and France. I worked in restaurants after college and eventually ended up heading to Brussels to get my master's degree. Even though I loved it, I didn't think working in the food industry long-term was an option. So I started working on a PhD. Then one day, it hit me that my heart wasn't in academia. I loved cooking for people and needed to be doing that as my main gig. I moved back to Seattle and started working in restaurants full-time. I was lucky to work for some very inspiring women chefs and eventually opened my own little cooking school. Three years ago I started my blog, Milly's Kitchen (in honor of my grandma Milly) and decided to learn photography to be able to share my food with more people via the blog. I signed up for a food photography workshop and fell in love with photography on the spot. The culinary and photography workshops I now lead abroad are a natural extension of my love of travel, food, photography and connecting with others. Isolation is one. I work from home (or hotel rooms when I'm traveling) and that can get pretty lonely. My solution is coffee shop work days so I can be surrounded by other human souls and collaborations with other chefs and photographers I admire. Taking care of all the little details is also a challenge for me. I'm a (recovering) perfectionist, and a bit obsessive, so taking care of every last detail is in my nature. The problem is I actually hate it! I would much rather spend my time creating recipes and cooking and shooting and meeting new people. But the details (booking flights, doing maintenance on the blog, paying bills) are what allow all the magical stuff to happen. When I tell people what I do, they often say: "Sounds tough!" and roll their eyes a little bit. I used to get offended because it actually is tough. I left the security of a steady job with a regular paycheck to follow my dream. I spend a lot of time attending to the parts of my business that aren't so fun: marketing, tech, accounting. And since I didn't study to do what I do now, I often feel like I'm making it up as I go along. But I don't get offended by this comment anymore. I take it to mean they wish they could follow their own dreams and I feel proud that I'm making mine happen. Have you found that being a woman impacts your experience in your field? Yes and no. No, because I work for myself now and don't need anyone's permission or approval to do anything. A great part of the appeal of being self-employed for me is not having to worry about sexual harassment or discrimination or macho attitudes in my workplace. Yes, because commercial kitchens are still pretty full of testosterone and bro-y attitudes. That's the whole reason I left. The constant stress and macho attitudes you find behind the scenes in a lot of restaurants are definitely not for me. If I'd found more collaborative rather than competitive kitchens to work in, I might still be doing that. But in the end, it's led me to where I am now. Which is a great place. In my day-to-day, I don't feel that being a woman impacts my career. But I'm aware that might change if I were to expand beyond food photography into more traditionally male-dominated sectors of the photography world. Follow Olaiya's food and travel adventures on Instagram! And spend time at her lovely site Milly's Kitchen.